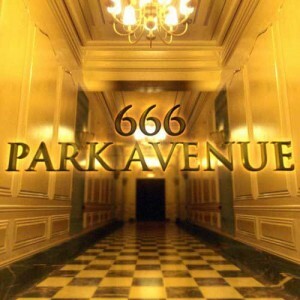 666 Park Avenue is one seriously creepy show. The supernaturally-inclined drama, which is produced by David Wilcox (and loosely based on a novel of the same name by Gabriella Pierce; I am tempted to read them just to see how “loosely”) is every bit as unsettling as I expected it to be. While I had read some reviews that said the show was more camp than creepy (and yes it does have some minor melodramatic flourishes) it doesn’t have one wink-wink-nudge-nudge bone in its body and plays it as straight as the trailer suggested it would. It fits in neatly with a raft of shows that address, to borrow some religious parlance, the idea that humanity must pay a price for its “sins”, whatever they may be. Shows like Falling Skies, The Walking Dead, Once Upon a Time and even dearly departed Lost all draw on the concept that mankind – in the case of Once Upon a Time, “mankind” can be as elastic a term as you need it to be – is simply getting its just desserts. But while the punishment in these other shows is real and immediate, in 666 Park Avenue it is insidiously slow, an evil cloaked behind the glossy veneer of success and dreams and desires, which clouds the ability of those about to pay the ultimate price that their demise is perilously near. In the world of The Drake, the apartment building at 999 Park Avenue owned by wealthy, sophisticated couple Gavin and Olivia Doran (Terry O’Quinn and Vanessa Williams who are both in fine form), nothing is for free, and your Faustian pact with the “devil”, who in this case really does wear Prada, comes with a very high price tag indeed. The pilot episode opens with a brilliant virtuoso violinist dazzling an appreciative crowd at the symphony who is lost in a moment of pure musical ecstasy when he notices his fingers starting to bleed. Racing back to The Drake with all the haste he can muster, he frantically packs and makes a break for the lift only to see all the doors that would lead him to the street and “safety” close dramatically on him. Ominously the antique phone nearby starts ringing, its insistent shrill tones echoing down the eerily silent corridor, and with what can only be described as extreme reluctance, he takes the call. The caller is Gavin Doran and as the one-time violinist pleads for a little more time, he is soberly informed by the Drake’s suave but malevolent overlord that his 10 years of success is up and that he must now pay for the undeserved talent with which he was bestowed. Refusing to accept that his dream life is dissolving in a cloud of sulphurous vapours, the man bolts for the life, managing to get to the lobby and out the front door, giving thanks, somewhat ironically to God, that he has made it out alive. But his respite from damnation is brief and as a small portal in the door opens, he is pulled through the small aperture by a mysterious unseen (but it must be said quite dexterous) force, never to be seen again. The sense of tension is palpable and the horror, though not overtly expressed, is very much in evidence. The only allusion made to the man’s disappearance is by concierge Tony DeMeo (Erik Palladino) when he tells the prospective new building managers, and New York newbies, Henry (Dave Annable) and Jane (Rachael Taylor) that the previous building managers went to “a warmer place”. Thought delivered with a hint of humour by Tony (but only a hint; this is after all a show determined to be taken seriously), the message is clear – the greatest violinist in the world, who was once a man of middling to average till he agreed to give “everything” to be the best, will not be coming to this world any time soon. Not that Henry and Jane, excited at the chances their move to New York care very much. They are too excited by the job offer that comes their way from Gavin after Jane, an architect and heritage consultant impresses the Drake’s owner with her knowledge of Art Deco architecture, and by the large apartment, and the nights at the opera and a thousand other seductive trinkets and baubles that come with the job. Neither of them gives a second thought there may be strings attached to the avalanche of sophisticated goodness pouring down upon them or that Gavin and Olivia may not necessarily have their best interests at heart. Of course we know that they don’t (I love the scent of dramatic irony in the air! ), and it is skin-crawlingly fascinating watching Gavin and Olivia quietly, but with menacing care, reel impressionable, wide-eyed Henry, newly installed at the mayor’s office (and who I suspect will need Satan himself to appear with a pitchfork to believe anything bad is happening) and Jane, who is far more apt to question things, into their dark, twisted web. Satan and his bride, which is what I think I shall tag Gavin and Olivia from here on in (yes a tad more melodrama), wisely surmises that the key to having the couple under their control is to ensnare Henry first which begins at, of all places, a golf driving range where Henry, newly installed in the mayor’s office, is put in a slightly compromising position when a shady business associate of Gavin’s pays a less than friendly call. While he shrugs this off, as he does most things, with a glib assurance, to himself more than anyone, that Gavin meant no harm, it is clear it is the first step in a master plan to have Henry boxed into a corner so tight he has no choice but to yield to Gavin’s will. Henry is pretty much the lamb to the slaughter, trusting and unsuspecting (and Gavin and Olivia are betting the one to take Jane along with him) and always ready to explain away the many odd unsettling things that happen at the Drake. Things that Jane, who is not as easy to fool and far more aware of what lies behind the shiny surfaces that so beguile Henry, can’t help but investigate. She is also far more attuned to the menace lurking in the shadows, and returns from the opera one night, looking dazzling in the $4000 red dress Olivia insisted on buying for her (oh obligation thou art a terrible master indeed and Gavin and Olivia know it) feeling psychically soiled and unwashed like some sort of darkness has brushed up against her and left a mark. While her investigations into the Drake’s history are driven more by her love of heritage and architecture than anything else at this stage, I have no doubt she will be the one who will, as the series progresses, become a very large thorn in Gavin and Olivia’s collective side. And Rachael Taylor is such a talented actress that she will eat this part up, already demonstrating that she can bring the required shades of darkness and light, strength and vulnerability, curiosity and an innate sense of wrong and right to the role. Alas Dave Annable on the other hand, who I loved in Brothers and Sisters, and who it must be noted is a very fine looking man, is not of quite the same calibre and may struggle to adequately portray the descent from wide-eyed innocent abroad to a corrupted soul on the cusp of damnation. There are other characters swirling around on the edges – handsome geeky Brian who is trapped in a marriage to high maintenance difficult Louise and is struggling to contain his lust for her new assistant Alexis, and jewel thief Nona, whose agenda is unclear – but essentially 666 Park Avenue, which is, at its heart, a good old fashioned morality tale, is Henry and Jane’s story and the first episode does a very good job of starting them on their journey into glamourous but deadly world of 666 Park Avenue. More “Miranda” this Christmas … such fun! I shared this–it’s a nice comprehensive overview–can you get blog buttons for Google+ and LinkedIn too?